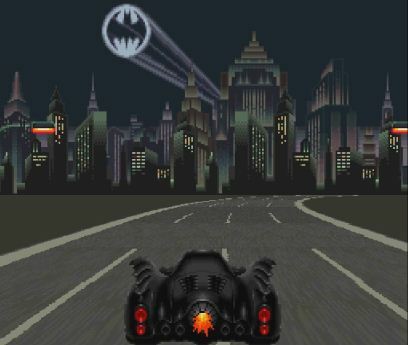 There were plenty of games on the Nintendo Entertainment System that featured the dark knight, but none even began to compare with this Super Nintendo title. The extra horsepower did of course help a lot, but games like Double Dragon showed that hardware did not make or break a game, as it was quite a popular title on the old 8-bit system. While I did just state that the graphics were “incredible”, let me remind everyone that I’m not a fan of eye candy over gameplay. That doesn’t mean I can’t tell good quality when I see it though, and this was certainly an example of such. Sure, it didn’t push the Super Nintendo to its limits, but it was still quite a sight for 1993 and the animations flowed nicely as bad guys were punched and kicked by the caped crusader. However, since this was a Batman game, the level of violence was kept rather low: No blood, no limb dismemberment, enemies simply disappeared upon having the crap kicked out of them by Batman (or each other, as friendly fire wasn’t exactly uncommon in this one). It did feature a lot of of non-graphic violence though, and plenty of asskicking with enemies in a lot of different shapes and sizes. From skinny to tall clowns clowns who threw torches at you, along with some who decided it would be cool to ride motorcycles; the bad guys were varied and many.. or were they? By the time you made it to level 4 (of 7), you were likely wishing for more variety among the enemies encountered, since the visuals were frequently recycled and it was (almost) always clowns. Clowns clowns clowns CLOWNS! Did someone forget to tell KONAMI that the Joker died in “Batman”, the movie before “Batman Returns”, and that the bad guy in this one was the Penguin? Guess it boils down to the typical brawler stereotypes: Variety and logic wasn’t exactly common for that genre.. Speaking of lacking variety.. as you moved through the streets of Gotham and other locales, not always taken from the movie, it did not take a keen eye to notice how the backgrounds often repeated themselves – just like the clowns! I did say this was a good game, but the fact remains that it’s a licensed title.. they’re known for not having the highest budget. Even with repeated backgrounds, the game still looked and sounded quite good, although the music wasn’t great (that could simply be a matter of opinion, however). The punches and kicks made a much more solid impact than the soundtrack, both physically as they made contact with the enemies and aurally by the player, as Batman steamrolled through a ridiculous amount of clowns towards the end-of-level boss battle; and that means it’s time for an annoying aspect of both this game, and just about any other brawler: The boss battles! 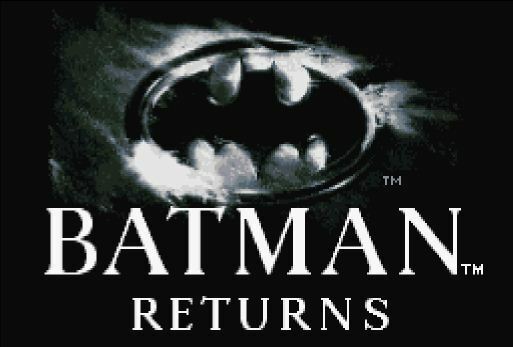 That’s right, Batman Returns was no exception: Boss fights were quite cheap and almost so difficult that unskilled players were lucky to make it far in the game. By the time the credits rolled, I barely had any lives left; mostly thanks to Catwoman, but all bosses shared a too high difficulty. Regular enemies were the opposite though, so I guess the game simply wasn’t balanced properly? Doubt we’ll ever find out, since I doubt KONAMI remember their little Batman game from the 90’s anymore. Oh but there was one thing that I found enjoyable about the boss encounters: The fact that there were but a handful of them! That unfortunately meant several were repeated in later stages. I’d like to know who came up with that brilliant plan? “Hey, let’s make them overpowered and have the player fight them more than once” yeah.. stroke of genius right there. While in recent Batman games, it almost seemed like he had more gadgets than he could shove into his utility belt, that wasn’t the case here. Grappling hook, batarang and a limited supply of flashbangs made up his arsenal; not much room for tactics. The same could unfortunately be said about the clowns.. not the brightest of the bunch, but as they say: Good help is hard to find. I would love to claim that there was a deep and original plot driving this one, but.. no. Remember: It’s based on a movie after all, and the story is more or less based on that, told through static cut-scenes. Let’s be serious though: Who looks for a plot in a brawler? Such games are all about beating up mindless drones, or clowns, not deep stories and dramatic events; though the first time a clown fired a rocket launcher at me.. that was quite dramatic! In spite of its issues, it was still an entertaining game and while certainly one of the better Batman games to date, it’s not the best. That title is held by the incredible Arkham Asylum.